I don't know why, but I was really excited to celebrate Easter this year. Maybe it's because we have a little boy in the house. That's probably it. Anyway, I started making plans a couple of weeks ago, and I think so far we are having some fun! We woke up at 7:00 and went downstairs. I left Anders' Easter basket on the floor and he bee-lined it. Instead of putting a bunch of chocolate in the basket I decided to put some small toys that Anders could use in Spring like sidewalk chalk, Play dough, stickers, a windmill, and bubbles. I also put in a bunny puppet that we had already, but Anders didn't seem to notice. We also had a little egg hunt. 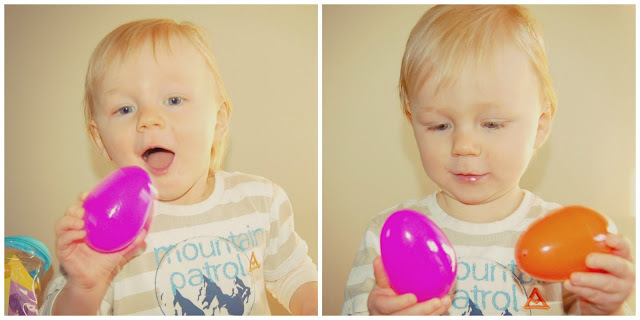 Derek had a great idea of putting Cheerios inside of the plastic eggs and Anders absolutely loved it. His eyes would light up whenever he found another egg. In the afternoon we went to my parent's for dinner. 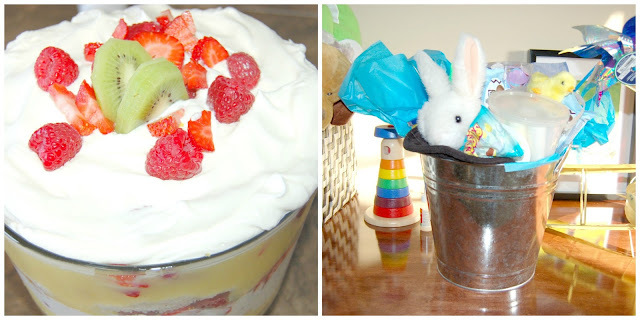 I made a trifle which was a nice spring treat. All in all we had a wonderful weekend and some nice family time. Now on with the snow melt, I want summer!